Happy National Cake Day! 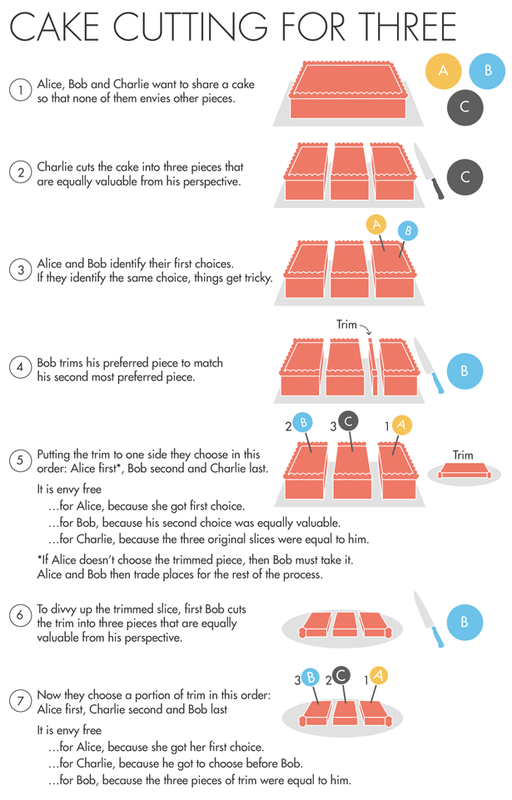 Cutting a cake into equal parts seems pretty straightforward. But not if you are an economist. A set of problems known as fair division or cake cutting problems have been stumping mathematicians, economists, and computer scientists for decades. The science of dividing things equally is rooted in real-world problems like how to divide a tract of land between a large number of heirs that is envy-free. The difficulty is that different people prefer different features of the cake (or piece of land). Some like the frosting, some like the middle, some like the iced flowers on top. Since biblical times, the fair way of solving this problem has been to let one person divide up the pieces and the other to choose first. But when more than two people are dividing something up, that process doesn't work very well. In the 1960s, two mathematicians devised an envy-free method for elegantly dividing a cake three ways. But their solution wasn't bounded, meaning it could theoretically take an infinite amount of steps, depending on how many preferences each party had. Little progress has been made since then on the cake-cutting class of problems. Until last year, when two computer scientists posted a new solution to envy-free cake cutting. It builds on the solution from the 1960s, except it is bounded, meaning it always takes a less-than-infinite amount of steps (n6 to be exact). Even for just a handful of parties, the number of steps could be greater than the atoms in the universe... but it's still bounded! You can see a diagram explaining their solution below. Fair division scientists are now trying to apply this new algorithm to the tricky (and currently very unfair) process of drawing electoral districts in some U.S. states. Let's hope it turns out to be a piece of cake! Quanta Magazine: "How to Cut Cake Fairly and Finally Eat It Too"
Scientific American: "The Mathematics of Cake Cutting"
Inside Science: "How To Cut Cake, According To Math"
New Scientist: "How learning to share cakes could help stop unfair US elections"